MasterBind Black 11" x 9" Mundial Hard Covers with tabs provides the stylish and premium presentation to any documents. The mundial material presents a leather grain look and feel, creating a professional and classy finish. Want to stand out from the rest? The mundial covers are design for a simple and easy foiling with either the MasterBind GoldPress 4+ or the MasterBind ImagePress . The no punching and gluing feature allows the pages to be free from binding damages, offering an exceptional finish product. With the additional tabs, it presents a more organize document. MasterBind provides other color options including white, burgundy and navy. For a superb and elegant covers that offers easy and simple foiling, there is no better choice than the MasterBind Mundial Covers. Welcome to MyBinding Video. 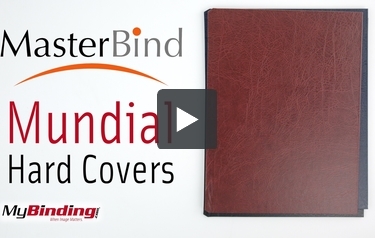 These are the Mundial Hard Covers from MasterBind. These covers take your pages and turn them into a luxurious hardcover book. The unique material presents the look and feel of real leather. They reflect softly in the light and are mostly smooth to touch. These covers can even be foil stamped for an extremely elegant look. These professional covers are available in white, navy blue, burgundy and black all in packs of 20. For more videos and all your binding needs, visit MyBinding.com.